I REMEMBER ME: "When I set my mind to doing something, I get it done," reflects Potts, pictured above with students of her alma mater in Portland. Every year on her birthday, of all days, Sandra Potts buys and presents a gift to someone of her choosing. More often than not, the lucky soul is an individual with a pressing need that Sandra wants to help take care of. 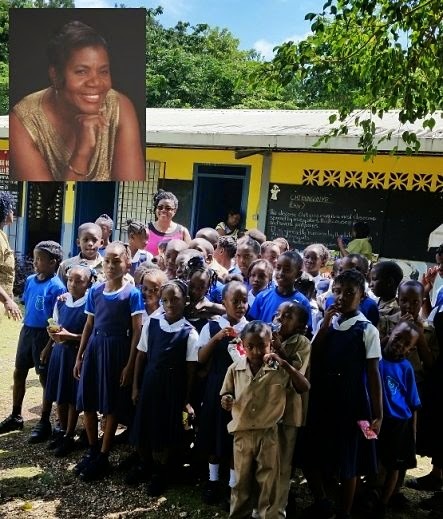 This kind of generosity and selflessness has served her well and defines the woman Sandra E. Potts is or, more to the point, the woman she has become. Hers is a remarkable and inspiring story that zooms into focus in her first book, a soothing and well-written collection of autobiographical stories, self-published as Bittersweet Memories. With the unflinching candour of someone who's seen it all and done the rest, Potts transports her readers from the rough-and-tumble Upper Fair Prospect in Portland, where she blossomed into a curious little girl with a taste for adventure and knowledge, to the super-competitive world of Wall Street, where she rose to become a force in her own right. But ask Sandra about the single most transformative period in her life, and she'll take you back to the horror of September 11, 2001, when the World Trade Centre towers came under the infamous terrorist attack ― and she lost her mom to cancer shortly thereafter. Instead of crumbling under the weight of these unspeakable losses, Sandra decided to embark on the biggest challenge of her life: becoming a full-time registered nurse. Trading the sharp suits and boardroom bravado of Wall Street for the antiseptic world of patients and hospital rooms meant going back to school to gain the necessary qualifications - which she did without hesitation. Today there are no regrets, and she spends countless hours at the Queen's Hospital in Brooklyn, which she now calls home. And, as she enjoys this change of pace and the bliss that comes with serving the people of her community, Sandra Potts is convinced that she's found her true calling. "When I set my mind to doing something, I get it done," she reflects, sitting across from me on warm Saturday afternoon inside Liguanea's Kingston Bookshop, on the occasion of a book signing for Bittersweet Memories. "That's how I choose to see life. Just set your mind on accomplishing a particular goal, and you'll start running in the direction that you want to go." Unsurprisingly, history, reflection and memory lend Potts' book a nostalgic quality that's a hallmark of honest introspective writing. "When people read my book I want them to be inspired and know that they can triumph over whatever it is that they're going through," says Potts, who has number of other book projects lined up, including a collection of her poems. "I've been there and done all of that, so this is my testimony of being lifted out of depression, facing the stresses of hard life and surviving to tell the story." Deeply committed to paying it forward, Potts has decided that all of the proceeds from Bittersweet Memories will benefit her alma mater Windsor Forest Primary in Portland. Acting Principal Paulette Donegan welcomes the gesture. "I feel elated because [the funds] will help us to open a reading resource centre and get some computers for the students," says the principal, who attended the book signing, with a trio of students. On May 1, Sandra Potts will be 54 years old. It's also her mother's birthday, she reveals. You already know how she will mark this special milestone. "I'm always thinking of giving back to somebody else," she tells TALLAWAH, her radiant glow seeming all the more pronounced. "I never think of celebrating me."